A PB4Y-1 on anti-submarine sweep from Ascension Island took off on 6 February 1944 at 0700 G.C.T. Visibility was good - (15 miles), and radar was not used. Wind was 1100 - 14 knots, and sea moderate. 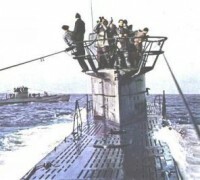 Submarine wake was sighted at 1025 G.C.T. from 2600 feet, at 12 miles. Submarine was sighted on course 1750 T. at 10 miles, fully surfaced When the plane was approximately 2 miles from the submarine, a moderate amount of heavy anti-aircraft fire was observed 100 yards ahead and slightly to port. The plane was put into a brief power glide and then pulled up. At three quarters of a mile and 1000 feet altitude, the plane went into its attack run, with the bow gun bearing on the U-boat's Conning Tower. No further anti-aircraft fire was observed near the plane. At 1029 G.C.T. the plane released 6 Mark 47 bombs with Mark 234 fuse - 25 feet hydrostatic setting; speed - 200 knots; spacing - 60 feet; altitude - 100 feet; drop made at 150 angle just forward of Conning Tower. Machine gun flashes were observed coming from a position near the Conning Tower, no men were observed on deck, and the U-boat gave no indication of attempting to crash-dive. The plane regained altitude to 800 feet after strafing by tail gunner, and banked to port to continue attack with the remaining 3 bombs. The 3 bombs were released at1030 G.C.T., the U-boat having been observed to turn 750 to starboard and to be about 25 feet below the surface. After regaining altitude, the plane came in low over the scene of the attack, nothing a large oil slick and survivors in the water.